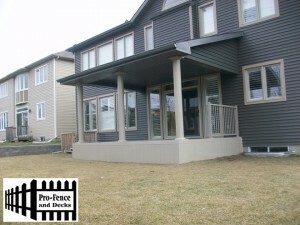 Pro-Fence and Decks Inc. Porch Decks Ottawa Installer/builder/contractor Ottawa. At Pro-Fence and Decks Inc. we installs all types of Wooden Porch Decks,PVC Vinyl Porch Decks and Composite Porch Decks to comply with any architecture in Ottawa. We build custom Porch decks using high quality materials to ensure a sturdy finish product to your home. Porches can be built to compliment your house using similar materials and by matching the roof style of your home’s architecture . Porch Decks increase the value of your home, expands your outdoor living space and offers many options for your outdoor entertainment. When it comes to choosing a Porch deck there are many designs, style and products to choose from for your project. Our team at Pro-Fence and Decks Inc. will help you make the right choice. If you are considering installing a Porch Deck on your property consult our Specialists here at Pro-Fence and Decks Inc. We would be more than happy to assist you with a free estimate and help you make the right choice.